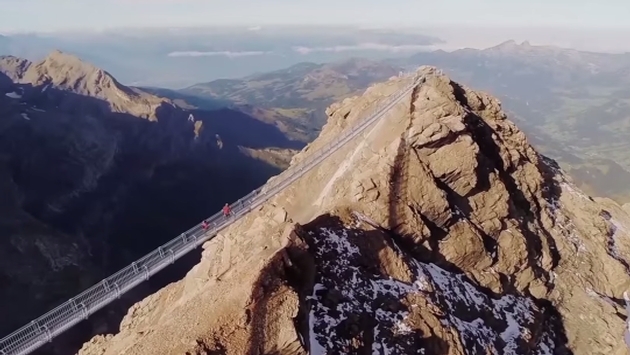 The Peak Walk Bridge in Switzerland’s Glacier 3000 Resort has that nice “make you think about your own mortality” quality going for it. NBC News posted the following video that features a report from The Weather Channel’s Matt Sampson, offering the specifics behind a bridge that offers views that are stunning as much as they are stomach-churning. According to the report, up to 300 people can enjoy a walk across the expanse, although we might be concerned with more than five on that thing. Then again, standing on a step stool is cause for alarm on this end. As for the specifics, the bridge is reportedly 351 feet long, bridging two peaks that sit 9,800 feet above sea level. To play the home game, imagine crossing the bridge that is just 31 inches wide as well. Suddenly putting Christmas lights on the house doesn’t seem so treacherous, because these amazing workers scoff at the obvious danger below. This concludes our coverage of extreme bridges that make us want to get down and kiss the ground under our feet.